John Wells’s phonetic blog: whoa! I'm not a native speaker of English but I'm fairly sure that wow! is pronounced differently in these cases (rhyming with American go); it does not sound like a British English diphthong. The dictionaries I checked only provide the usual pronunciation (rhyming with "cow"). I was wondering if they might be homographs, the "normal" wow! expressing admiration, etc. and the other one apprehension or something along these lines. However, no wow! with this function is listed in any of the dictionaries I consulted. The interjection meaning “slow down!” and rhyming with (British or American) go is normally spelt “whoa!”. Perhaps these are just spelling mistakes. I wonder if there is anything more to it than that. I’m not aware that the slow-down interjection whoa! is pronounced with something that “does not sound like a BrE diphthong”. As far as I know, it is straightforwardly a homophone of woe, pronounced with the local GOAT vowel whatever it may be. Other languages seem to use quite different interjections in this sense: French holà!, German brr!, Spanish ¡so! would I beat him? Oh dear, no. The OED gives spellings and definitions that seem exactly right. So perhaps there are two possible ways of interpreting this cartoon. 1) In both of the original examples, wow sounds fine to me, and would be used to express astonishment and surprise. Someone is excessively (and unexpectedly) agitated, and you're telling them to calm down. 2) I think there's a third interjection, pronounced the same as whoa, but maybe spelled woah or woh. That's what's being said in the cartoon, and it combines the two meanings - an expression of surprise and a request to stop. The cartoonist has spelled it "whoa" (which as Alan Partridge once said is "English for stop a horse") because they're homophones, but it's not exactly the same word. What's interesting about whoa is that despite the spelling with ‹wh›, I always pronounce it homophonously with woe, despite the fact that I normally make the which-witch distinction. So even though I normally say [hwaɪt] for white, I would never, ever say *[hwoʊ] for whoa. As for semantics, I don't think wow and whoa are ever complete synonyms, but an expression of surprise or astonishment can easily contain an aspect of "slow down! ", so there may be times when either word would be appropriate. In Ms Stange's examples, I'd say the meaning of wow is "I'm surprised you're reacting so strongly"; and in the comic the meaning of whoa is "Slow down; don't jump to conclusions". 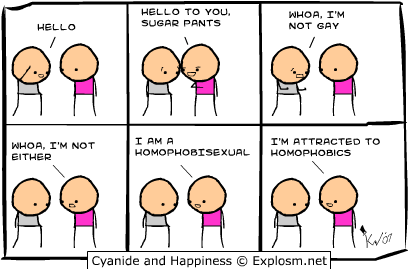 Also in the comic, I would have made the last word of the last panel homophobes. Homophobic is only an adjective for me, not a noun. Agree with Matthew - both Wow ("I'm expressing surprise") and Whoa ("Slow down") work perfectly well as different utterances in the original examples at the top. 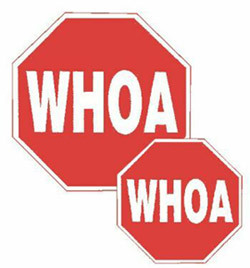 My pronunciation from childhood of whoa = stop a horse, esp in the phrase 'whoa on' = hang on, has been wu: not woʊ, making it homophonous with 'woo'. Is this an Australianism (which is where I'm from) or merely aberrant? For me, the whoa that is used to slow/stop a horse (and by extension a person) does have a different vowel quality from the regular BrE əʊ : more woʊ or even just wo with no diphthongization. "As an expression of delight or surprise (1980s) it has gradually superseded 'wow', which was very popular 1960s." This is something I (an Australian) have discussed with my British boyfriend in the past. It started one day when we realised that for him, 'woe' and 'whoah' are homophones, but for me, they are not. He uses the GOAT vowel for both, whereas I use (the Australia equivalent əʉ) only for 'woe', and for 'whoah' I use something else entirely. I’ve been sitting here trying to figure out how it would be transcribed, but all I can figure out is that it is composed of rounded back vowels. For an example, see this video that I first discovered when I was trying to show my boyfriend that it wasn’t just me - http://www.youtube.com/watch?v=zZyFLdkDO9s - she says ‘whoah’ once at around 1:58, and a particularly clear ‘whoah, cat!’ at 3:48. After finding that video I was quite sure that it wasn't only me that did this, so I set up a little experiment. I wrote out a passage, a short story, that used both 'woe' and 'whoah', and I asked some Australian friends to call my Skype and leave a voicemail reading out the text. It appeared that to them also ‘woe’ and ‘whoah’ are not homophones. I was able to find the voicemails (from almost exactly a year ago! ), so I will email them to you to show you the results. @Kel - I'd say it's a specific allophone of GOAT, something like [ö:ʊ]. "For me, the whoa that is used to slow/stop a horse (and by extension a person) does have a different vowel quality from the regular BrE əʊ : more woʊ or even just wo with no diphthongization." And others have given either direct or indirect evidence of this variance in Australian English. I think Matthew's point 2 is also evidence of an awareness of this. The sound in question cannot be "a specific allophone of GOAT" as Andrej suggests, because any such allophone would have to be determined linguistically, and this variance is determined extra-linguistically, in that qua interjection, the sequence does not partake of the double articulation (into pleremes in grammar, and phonemes in phonology), which makes such sequences logically unanalyzable and therefore extra-systematic, or paralinguistically, in that qua word (the word 'whoa' in conventional orthography, as a lexical item which may be more susceptible of grammatical and phonological categorization) it is distorted by extremes of phonation or intonation which are extraneous to language proper. There's quite a close parallel with 'oh!' and 'ow!'. For me these are /əʊ/ and /aʊ/, but I often find myself making noises like [ow(ː)], [ɔw(ː)] etc, depending on the degree of annoyance, pain, etc., for either of them, but they would be identifiable by linguistic or extra-linguistic context as one or the other, and I would know how to spell them appropriately in my diary! John implies that Ulrike is doing this research on English interjections in written sources rather than in speech, as he says of the instances of "wow", "Perhaps these are just spelling mistakes." We need to know this. At first I was not sure whether she was interpreting a spoken interjection in a way that she found was not recognized by dictionaries, or speculating about a similarly unrecognized pronunciation of a written interjection. "I'm not a native speaker of English but I'm fairly sure that wow! is pronounced differently in these cases (rhyming with American go); it does not sound like a British English diphthong." But either way I think the answer to John's "I wonder if there is anything more to it than that" is yes. I agree with him that the word "whoa", i.e. the lexical item with that conventional spelling, is straightforwardly a homophone of 'woe', pronounced with the local GOAT vowel whatever it may be. But in actual utterances of the interjection of which that is a representation you are more than likely to get 'something that “does not sound like a BrE diphthong”', like the noises I have admitted to making above. As for the overlap between the uses of "whoa" and "wow", I think John's quote from the Urban Dictionary is adequately explained by Andrej's from the Online Etymology Dictionary. I propose the term "dude drift" for it. His YouTube clip says it all, complete with the dodgy phonation we're talking about. Tonio, the anomalous absence of the pronunciation [hwoʊ] from your idiolect is more evidence of the extra-systematicity of the interjection, but it seems plenty of AmE dictionaries do have it and also sound files for both that and [wɔʊ] with an anomalous diphthong. Wiktionary has both /ʍəʊ/ for UK and /ʍoʊ/ for US. Kel, do you agree that since Aus 'whoa' is more obviously different from 'woe' than in the BrE and AmE examples, djbcjk's homophony with 'woo' is also a possible identification? There's a related interjection, expressive of lust, often spelt "hwoar!" (the exclamation mark is always included). I've often seen it written; when I've (less often) heard it it's been very breathy. Perhaps it's just an emphatic variant of "wow"? On the subject of interjections, how do people pronounce "ugh"? @ lest: You mean "ugh" the expression of disgust? I'm American and my pronunciation varies, possibly depending on how disgusted I am. It's usually an [ʊ] or [ʌ] type vowel followed by some sort of fricative towards the back of my mouth. It might be a velar or uvular fricative if I'm especially disgusted. I have a hard time hearing the difference between those two. It could be an [h] type sound too sometimes. There may be no consonant at all at other times. I was going to use examples like these to back up my case, but I do go on. So thanks for bringing them up for me. I'm not sure "hwoar!" (in my experience usually spelt "phwoar") is in fact related specifically to "whoa! ", tho I can see why you might think that, but it certainly meets my criteria for an "interjection". So why be diffident about whether it's just an emphatic variant of "wow"? It's somewhere on the spectrum of the unindividuated totality of extra-linguistic phonation on the hoof! (I get stich for elusive allusions: so v v. Quine.) Like ɸɔɐː. Try putting that in solidi for any English dialect! Of "ugh" I was going to say "yuk", "yeuch" etc were not distinct from that either. Phil's "depending on how disgusted I am" is the giveaway. Language proper is not like that. It abides by fully fixed conventions. I think I have a pretty good idea what these purely orthographic conventions connote (and I'm afraid they don't do much actual denoting) in AmE as well as BrE: ʌx/χ/h, ʊx/χ/h, jʌx/χ/h, iːˈ(j)ʊx/χ/h, ɨːə(x/χ/h), ÿːə(x/χ/h). And then there's ɲɘːɜ etc. And there are even conventions for that: nyeurgh, or nyeugh, which is even in the celebrated Urban Dictionary. I have /w/ in some interjections with "wh" (whoa, whoops, whoopee) and /ʍ/ in others (whee, whisht -- and perhaps whew). Onomatopoeia always has /ʍ/ (wham, whack, etc). The 'whoa/woah' question is the one that attracts the most Googlers to my blog. The post, if you're interested, is here. So John is on the ball about non-speech, bless 'im. Tho I would prefer to call them non-language. @ mallamb: I know I don't contribute much to the discussion, but thank you for making me feel like I do :) I mainly come here to learn actually. FWIW, I don't think it's a spelling mistake. 'Wow' with a falling tone (indicated by the full stop) is fairly common in spoken English amongst younger speakers, often indicating something like disapproval at an over-reaction. So seeing something like 'Wow. Take it easy.' in dialogue or in a post online seems highly unremarkable to me. And it would have a different kind of semantic colouring to 'Whoa, take it easy. ', in which 'whoa' would to me indicate 'hold on, slow down'. Getting back to the original question: I suspect that the spelling wow to represent the sound of whoh is by someone, like me, who had always read the written whoah as who-ah, i.e. 2 syllables. Whoh rhyming with woe as an expression indicating the need to stand back, slow down, etc. I think the original author intended the second pronunciation but used a spelling that is usually reserved for the first one. I have met many Americans who use /hoʊ/ as an interjection meaning 'stop, slow up', which I understand as a variant pronunciation of whoa. The matter isn't certain, because I've never heard anyone say this to a horse. However, I have heard my wife say /hɔː/ to a horse, and the horse clearly understood it as whoa. She must have learned this form orally, and if it is traditional, it suggests that whenever whoa was first written down, oa had its Middle English vowel quality, surviving today only in a few words like broad. The sound-change /hw/ > /h/ occurs in a few other words: who, for example. I would interpret this as someone being surprised at a strong reaction to something, rather than being strictly homonymous with 'whoa'. And pronounced /wau/ rather than /wou/. This may be the un-English diphthong in question. Why does anyone here think for a moment that the spelling wow is used to represent the sound rhyming with woe at all? The one rhyming with cow seems totally unremarkable here, and anyone who like you had always spelling-pronounced the written whoa as 2 syllables and wanted to write [wəʊ/woʊ] would surely not have chosen to do it so ambiguously. I have often seen "Wo!" for example, and though it would still be ambiguous to write the analogous "Who!" if you say [hwoʊ], the obvious nonce spelling is "Whoh! ", as you do write it. And this "who-ah" for horses, do they understand it? What you say about the spelling 'whoa' reflecting the Middle English vowel quality and the sound-change /hw/>/h/ is exactly what I too had supposed. 1) Q: if joy is the opposite of sorrow, what is the opposite of woe? I must have learnt this one when I was about ten.